A widespread investing myth is the time diversification fallacy–the belief that young people should hold riskier assets than old people. People imagine a young person’s portfolio to be safer than an old person’s because it is somehow protected by time. This idea is a dangerous weed that cannot be easily uprooted. Here are my own arguments against it. Suppose that the markets have been consistently earning 8% annually. Then one year there is a -50% crash. After that the markets return to their consistent 8% returns. The chart below shows how two investors would fare. Both start with the same $10,000 stake. The first was 20 at the time of the crash and the other was 59. If someone advises you that you should hold a straight equity portfolio for the first 20 years of your career and then switch to more reliable bonds for the next 20 years, remind them of commutativity. Explain that your expected return would be the same as if you held the bonds for the first 20 years and then straight equities for the next 20 years. If you are going to change your asset allocation over time, the order of which portfolio you hold first is irrelevant. Young investors should only plan on becoming more conservative over time if they also believe it makes good sense to start conservative and get more aggressive every year until retirement. This argument is meant to appeal to the mathematicians. Every environment contains an efficient frontier, and the goal of portfolio management is to stay on the frontier. It’s easy to construct one portfolio that is aggressive and one that is conservative, although both are on the frontier. Suppose an investor held each portfolio, one at a time, for a certain number of years. 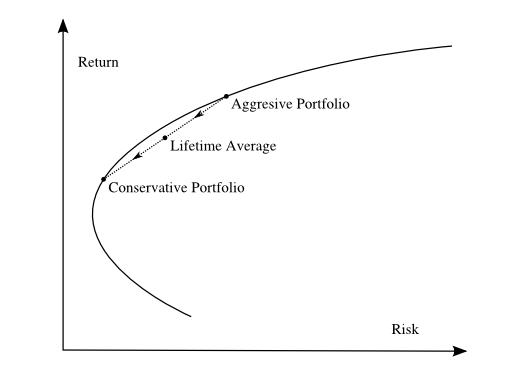 The cumulative risk and return would be equal to the averages of those of the two portfolios. Graphically, the average would be a point midway between the two portfolios. Since the efficient frontier is a convex curve, the average itself would not be on the frontier. The investor’s cumulative lifetime portfolio would not be as efficient as if it had been consistently aggressive, or consistently conservative, or a consistent combination of the two. An intuitive counter-argument exists. Over a lifetime, most people will save thousands of dollars from their steady income. So if they were to lose all their money at 20 years old, they could still recover by putting aside more savings in the future. A market crash would be more devastating at 60 years old when people can’t produce as much capital. This is a sound objection that ought to be factored into the model. A young person with $10,000 savings and a $100 monthly savings plan actually commands about $25,000 in assets, if you count the present-day value of the expected savings. The $15,000 of expected savings could be risky, depending on how steady the income is. So the other $10,000 might need to be placed in assets that offset that volatility. If the income is reliable, then the accessible $10,000 could be placed in straight equities as an offset. At retirement, the same person would have $500,000 of investments and no more expected savings. Since the accessible investments are no longer offsetting anything, they would be allocated differently than before. The human capital argument should not be interpreted to mean that a person’s overall portfolio grows more conservative over time. It means that a rational investor will target a consistent risk profile at all ages. As part of a holistic strategy, the value of human capital should be included in the portfolio. An investor who understands the value of consistency will be able to retire with larger and safer investments.